The arrest of a community leader and threats of more, this week became central to a protest at a settlement outside Johannesburg, where a fight for services has not turned into a fight against the police – yet. But when it comes to putting down insurrection, it isn't easy to figure out who to detain when. By PHILLIP DE WET. 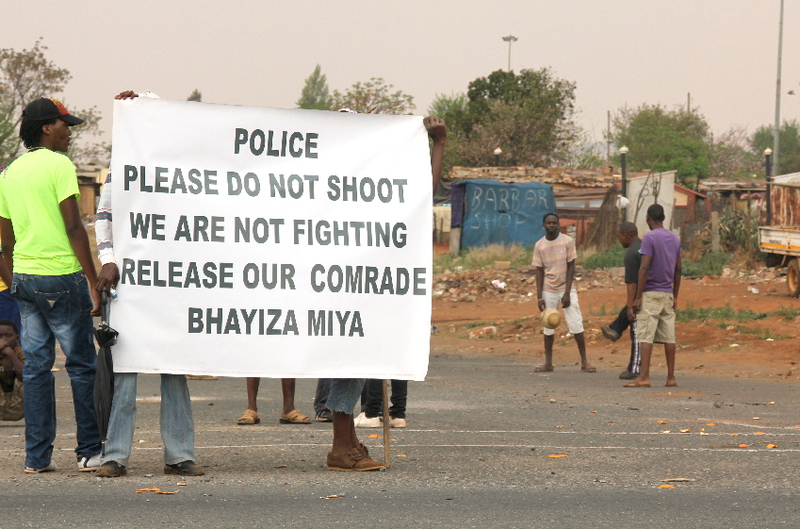 Bhayiza Miya is the eloquent, politically and media savvy leader of the core of protesters responsible for demonstrations in Themb’elihle near Lenasia. 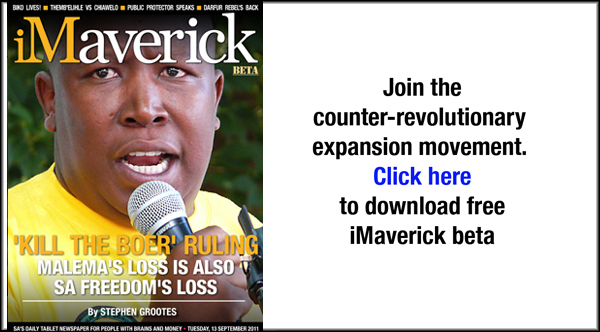 Soon after things turned violent last Monday – something the political leaders say they deplore and had no hand in – Miya started keeping a lower profile, avoiding gatherings out in the open and refusing to attend meetings. It wasn’t enough, though; on Tuesday he was arrested on a charge of intimidation. Others had been arrested the week before, but those had been random, people plucked out of groups. This, it seems, the protesters found fair. They acknowledge that there had been public violence and illegal gatherings, even if they consider the violence mostly justified and a ban on gatherings to be unconstitutional, and were reasonably content that their comrades quickly received bail. Miya, on the other hand, was specifically targeted, which, combined with his relatively elevated stature, made for all manner of conspiracy theories: he was being mistreated, he was being interrogated, he was being transported elsewhere (for some dark purpose), his arrest had been ordered by the ANC, the President, or orchestrated by the intelligence services. By Wednesday, Miya’s detention had become the new rallying point for the protesters. Residents who had been tired the day before, or had gone back to work, returned to show solidarity with their presumably being martyred colleague. As usual, the truth was more complicated. Miya had been charged with a fairly serious offence in the middle of a pretty unstable, and sometimes violent, situation. The arrest was not so much political as apolitical; had they refused to bring him in, the police would have had some explaining to do. Watch: Police arrest two suspects in Themb’elihle last Tuesday, during the height of violence there. But Themb’elihle has, in the past week and a half, seen its share of political arrests, and political non-arrests, and some that fall in between. As the blunt end of the government interacting with the people in the street, the police’s every move is being closely watched, and what it does, or doesn’t do, or is thought to have done, could have a big impact on how the Themb’elihle uprising goes and how it ends. Last Tuesday, for example, police arrested two young men they strongly suspected had hurled rocks at them. As colleagues held back an angry crowd with rubber bullets, officers pulled the two from an outdoor toilet, dragged them to the edge of the township and handcuffed them together. It was only 11:00, but it had already been a hard morning of running battles. So it would have been easy to interpret what happened next as petty and vindictive: the two handcuffed suspects, now docile and obeying instructions, were paraded in front of the crowd gathered 100 metres or so away, made to show off their cuffed wrists and told to exhort their comrades to calm down. That interpretation would also have been wrong, though; a short time later the two detainees were set free, to applause from a non-violent group of mostly women nearby. The effect on the angry crowd was probably not a positive one, but the broader community approved that their wayward sons had been returned to them. The police had made a point about their ability to detain, but hadn’t pushed. Others were not quite so lucky. That night, after being urged to go into the township on foot, in the dark, amid reports of live ammunition being used and make arrests, police pulled out groups that included young women who would later claim they had been hiding in their homes all along. At least two men claim police shot and wounded them for no apparent reason, though those claims are still being investigated. A heavily pregnant woman said she was man-handled even though she had never taken part in the protest, although she suffered no serious harm and her allegations could not be substantiated. Though they’ve had rocks thrown at them and barricades erected against them, the police have not been targeted in any serious way during this uprising. Some, in fact, respected their restraint and professional manner. On Wednesday, though, for the first time, it seemed that could change. Not that a lack of firm police action would be any safer for either police or residents. During the last week-and-a-half various residents from Lenasia, a far richer suburb just across the road from Themb’elihle, at various times threatened to take up arms against their neighbours. Reports of planned marches into Lenasia itself caused minor spikes of panic, talk of evacuating children in the face of imminent looting. Cooler heads (or the police) invariably prevailed, but if the police presence had been any smaller, any less visible, or police had been perceived to not be in control, that may well not have been the case. Police discuss strategy before a late-night push into Themb’elihle last week.